Aceh (pronounced AH-chay) is one of the provinces of Indonesia and designated as a Special Territory of Indonesia, located on the northern tip of the island of Sumatra. Its full name is Nanggröe Aceh Darussalam. Past spellings include Acheh, Atjeh and Achin. Aceh is known for its political independence and fierce resistance to control by outsiders. There is a sociocultural divide as well; the Acehnese practice Islam, while the rest of the archipelago tends to blend Islam with animism. Since 1976, Aceh has been torn by a separatist conflict waged by the Free Aceh Movement (GAM) against the Jakarta government over control of resources, and over cultural and religious issues. Aceh has substantial natural resources, including petroleum and LPG (Liquified Petroleum Gas). Aceh was the point of land closest to the epicenter of the massive 2004 Indian Ocean earthquake, which triggered a tsunami that devastated much of Aceh's western coast, including part of the capital city of Banda Aceh. The government of Indonesia's positive response to this disaster contributed to a peace agreement with GAM, signed on August 15, 2005. Aceh's climate is almost entirely tropical, with the coastal plains averaging 82 °F (28 °C), the inland and mountain areas averaging 79 °F (26 °C), and the higher mountain regions, 73 °F (23°C). The area's relative humidity ranges between 70 and 90 percent. There is a dry season (June to September), influenced by Australian continental air masses, and a rainy season (December to March) resulting from mainland Asia and Pacific Ocean air masses. Western Sumatra has rainfall measuring more than 78 inches (2,000 millimeters) per year. Banda Aceh, the capital, lies at the mouth of the Krong Aceh and Krong Daroy rivers where they enter the Indian Ocean, and is the administrative and trading center of this mountainous region. The main local agricultural product is rice. Petroleum and natural gas, of which Sumatra has extensive reserves, is exported through Banda Aceh. The Great Sumatran Fault, a transform fault, runs the entire length of Sumatra. The pressure on this fault increased dramatically after the December 2004 earthquake. The fault ends directly below the devastated city of Banda Aceh. In addition to the threat of tsunamis and earthquakes, natural hazards include periodic floods, severe droughts, volcanoes, and forest fires. An ancient name for Sumatra was Swarna Dwipa, (Sanskrit for Isle of Gold), apparently because mines in the Sumatran highlands were producing gold from fairly early times. The province is located along the India-China sea trade route. By the seventh century, several trading towns on Aceh were flourishing—especially on the eastern coast—and were influenced by Indian religions. The most notable of these influences were the Srivijaya and the Sumudra. Srivijaya was a Buddhist monarchy centered in what is now Palembang. Dominating the region through trade and conquest from the seventh to the ninth century, the kingdom helped spread the Malay culture throughout Sumatra, Malay Peninsula, and western Borneo. The empire was thalassocratic, a maritime power that extended its influence from island to island. Srivijaya influence waned in the eleventh century. The island was then subject to conquests from Javanese kingdoms, first Singhasari, and subsequently Majapahit. At the same time, Islam made its way to Sumatra, spreading through contacts with Arabs and Indian traders. By the late thireenth century, the monarch of Samudra kingdom (now in Aceh) had converted to Islam. Ibn Battuta, who visited the kingdom during his journey, pronounced the kingdom "Sumatra," hence the name of the island. Samudra was succeeded by the powerful Aceh Sultanate, which survived to the twentieth century. From the beginning of the sixteenth century, the Sultanate of Aceh was involved in an almost continuous power struggle first with Portugal, and then, from the eighteenth century, with British and Dutch colonial interests. At the end of the eighteenth century, Aceh lost control of Kedah and Pinang on the Malay Peninsula to the British. By the early nineteenth century, Aceh had become an increasingly influential power due to its strategic location. In the 1820s, it produced over half of the world's supply of black pepper, bringing new wealth for the sultanate. In 1819 the British government had acquired exclusive trading privileges with the sultanate, but a subsequent Anglo-Dutch agreement (1824) made the sultanate virtually a protectorate of the Netherlands. Local resistance to Dutch control culminated in a long and bitter conflict (1873-1908). 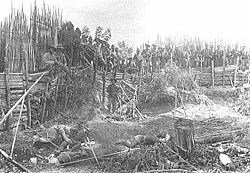 Estimated total casualties on the Aceh side range from 50,000 to 100,000 dead, and over a million wounded, with the Dutch retaining some power. Colonial influence in the remote highland areas was never substantial, however, and limited guerrilla resistance remained. Led mostly by the religious ulema, or mullahs, intermittent fighting continued until about 1910, and parts of the province were still not pacified when the Dutch Indies became independent Indonesia following the end of the Japanese occupation. During the Indonesian National Revolution after World War II, when the Dutch military attempted to regain control of its former colony, Dutch forces did not attempt to invade Aceh. Upon independence, Indonesian troops were dispatched to annex the region, causing resentment over what some Acehnese viewed as foreign occupation. From then, there were periodic armed conflicts between the Indonesian military and local forces fighting for greater independence. In 1959 the Indonesian government gave Aceh a "special territory" (daerah istimewa) status, giving it a greater degree of independence from the central government in Jakarta than most other regions. For example, the Aceh government is empowered to construct a legal system independent of the national government. In 2003, a form of sharia, or Islamic law, was formally introduced. 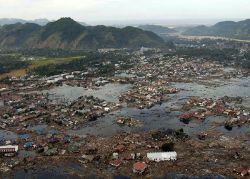 A 50-foot high (15 meters) tsunami following a 9.0-magnitude Indian Ocean earthquake on 26 December 2004, devastated the western coast and islands of Sumatra, particularly Aceh province. While estimates vary, approximately 230,000 people were killed in Aceh, and about 400,000 were left homeless. While parts of Banda Aceh were unscathed, the areas closest to the water, especially in Kampung Jawa, were destroyed. In 2005 there was an 8.7 magnitude aftershock. Within the Republic of Indonesia, Aceh is governed as a special territory (daerah istimewa), an administrative designation intended to give the area increased independence from the central government in Jakarta. 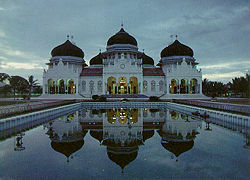 The capital and largest city in Aceh is Banda Aceh, located on the western coast near the northern tip of Sumatra. Other major cities include Sabang, Lhokseumawe, and Langsa. Administratively, the province is subdivided into seventeen regencies and four municipalities. Aceh has a long history of resistance to foreign control. Many Acehnese believe that most of the benefits of the region's petroleum exports go to the Jakarta government and foreign corporations. There is a sociocultural divide as well; the Acehnese practice Islam, while the rest of the archipelago tends to blend Islam with animism. The secular nationalism of Suharto's New Order regime (1965-1998) was viewed as a cover for Javanese chauvinism. Groups began to push for greater autonomy or complete separation. Out of these emerged the armed secessionists of the Free Aceh Movement (GAM). Conflict between the GAM and Indonesian forces led to the imposition of martial law. A Cessation of Hostilities Agreement (CoHA) was signed in 2002. This collapsed in May 2003, however, and the government re-introduced martial law and began a large-scale offensive and occupation. Widespread human rights abuses were alleged. After the tsunami in December 2004, a cease-fire was declared. A treaty was signed in Helsinki on August 15, 2005. The European Union and five Southeast Asian countries sent 250 observers. In December 2005, the military wing of GAM was disbanded, and the final pull-out of Jakarta troops took place. The Jakarta government has agreed to allow GAM—a purely Acehnese organization—to contest elections on a provincial level. Since February 2006, there has been peace in Aceh. The population of Aceh before the December 2004 tsunami was 4.271 million, but was recorded as 4,031,589 in 2005, and represents almost two percent of the Indonesian population. Aceh is a diverse region occupied by several ethnic and language groups. The major ethnic groups are the Acehnese (who are distributed throughout Aceh), Gayo (in the central and eastern part), Alas (in southeastern Aceh), Tamiang (in Aceh Tamiang), Aneuk Jamee (concentrated in southern and southwestern Aceh), and Simeulue (on Simeulue Island). There is also a significant population of Chinese, who are influential in the business and financial communities. The Acehnese language (Basa Aceh) is widely spoken within the Acehnese population. It is a member of the Aceh-Chamic group of languages, whose other representatives are mostly found in Vietnam and Cambodia, and is also closely related to the Malay group of languages. Basa Aceh has many words borrowed from Malay and Arabic and traditionally was written using Arabic script. Basa Aceh is also used as local language in Langkat and Asahan (North Sumatra), and Kedah (Malaysia), and once dominated Pulau Pinang. Alas and Kluet are closely related languages within the Batak group. The Jamee language originated from Minang language in West Sumatra, with just a few variation and differences. A majority of people in Aceh are Muslims (97.6 percent). Most central Bataks, meanwhile, are Protestant Christians (1.7 percent), the religion spread by the Dutch. The rest follow Hinduism (0.08 percent), Buddhism (0.55 percent), Catholicism, and Chinese traditional beliefs. Aceh was once a meeting point for people from many nations, and among the present day Acehnese can be found some individuals with blue eyes, as well as others of Arab,Turkish, and Indian descent. Before the tsunami, the region of Daya (Lamno) area used to have an unusually high number of people with fair complexions, and local traditions attributed this to Portuguese ancestry. Aceh possesses one of Indonesia's largest reserves of oil and natural gas. A number of multinational corporations maintain a presence in Aceh. Aceh's main sources of income are petroleum and natural gas, fertilizer, and agriculture. Aceh also has natural resources that have not yet been exploited. Food crops include rice, corn, peanuts, peas, cassava, vegetables, sweet potatoes, and fruits. Fruit-producing regions are Aceh Besar (mangoes, rambutan, langsat, durians) and Aceh Utara (bananas, papaya, soursop, oranges). Vegetables and fruits from drier highlands are grown in Aceh Tengah (cabbage, tomatoes, potatoes, avocados, marquises, oranges, and pineapples). Commercial crops include palm oil, rubber, coconut, coffee, and cacao. Annually Aceh produces 300,000 tons of crude palm oil, 65,000 tons of palm kernel, 80,000 tons of rubber, 60,000 tons of coffee, and 100,000 tons of copra (dried coconut meat used to produce oil). Aceh also produces nutmeg, sugar cane, patchouli oil, and areca nuts. Tuna, skipjack, shark, bawal (stromateus), mackerel, and shrimp are all found in the deep sea and coastal waters. Forest products include logs, sawn-timber, processed woods, plywood, block-board, and wood chips. Aceh also exports non-wood forest products like meranti (shorea) wood, semantok lime, marine resin, pinus mercussi (a raw material used in many industries like paper making and ceramics), and honey resin. Mining produces petroleum, liquefied natural gas, coal, gold, iron, platinum, copper, tin, and cement. Aceh has seven airports and has 13 seaports. Acehnese people are proud of their long tradition of a separate identity. They are also proud of the numerous heroes and heroines in their history. The culture of Aceh is basically Islamic, with Hindu and Buddhist influences remaining from before Islam arrived. At the age of seven, children start to learn Islamic prayers and begin to recite from the Koran (Al Qur'an). It is believed that communion with Allah can be achieved through prayers five times a day. The title "Teungku (Tgk)" is given to prominent religious leaders. Title "Tuanku" or "Sayed" and "Teuku (T)" is used for descendants of important land-owning families during the sultanate. The title "Cut Nyak" or "Po Cut" and "Cut", are used for female members of these families. Close family ties typify community life in the rural areas. The village, called the "gampong," is the smallest administrative unit. Each gampong is led by a gampong head, who is called a "keusyik." He takes care of daily village administration, together with the religious leader, the "teungku imum." The keusyik is assisted by "tuha peut" or four old and respected assistants representing the community, and by a "teungku imam," a religious leader. In each gampong there is a building called a "meunasah," which functions as the gampong administration center, religious services education hall, a community hall, discussion center and meeting place. Arts and culture are important in Acehnese society. Each village regularly participates in cultural events. Aceh has a unique style of dance and music. There are regular dance competitions and music sessions. Weddings, circumcision celebrations, or the arrival of an important dignitary to the village require the presence of traditional dancers and musicians. During the last few years Saman dancing has become popular and is often performed on television. In Indonesia, education is not free and is compulsory for children through grade nine. Although about 92 percent of eligible children are enrolled in primary school, a much smaller percentage attend full time. About 44 percent of secondary school-age children attend junior high school, and some others of this age group attend vocational schools. Under the autonomy law, education is supposed to receive a guaranteed 30 percent share of profit from the rich Exxon-owned gas fields in Aceh—around $50 million each year—but endemic corruption means much of this money vanishes. Rebuilding of schools after the tsunami was slow. Soccer and volleyball form an important part of their community life. Sport provides entertainment on a large scale, particularly in the more rural communities where access to shops, cinemas, radios and televisions is limited. The Acehnese have a unique way of seeing and dealing with trauma, which is understood through the term “rhet roh,” meaning a "falling of the spirit." They respond readily to forms of healing described as "peusijuk." This term means "restoring the spirit and dignity" and traditionally involves various rituals and ceremonies through which people come to grips with what has happened and regain a sense of what it means to move on. Sharia law was put into effect in January 2002, alarming non-Muslim minorities. In September of that year, the Aceh legislative council announced that caning or imprisonment would be the punishment for those who propagated beliefs other than Islam. Anyone who skips Friday prayers three times in a row without an acceptable reason would be fined a maximum of two million rupiahs, six months in jail or three strokes of the cane. Caning also applies to those who open their food stalls during Ramadan (fasting month). Christian commentators noted that most Acehnese people do pray regularly, and attend the Friday prayers, but not everyone in the cities would have complied. They note that sharia law is replacing traditional ways—referred to as "adat"—which regulated daily life. The role of adat is recognized in Indonesian law, and was central to the role of Acehnese rulers in pre-colonial Aceh. This page was last modified on 29 January 2019, at 23:08.